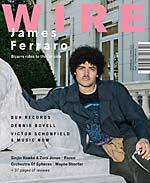 "James Ferraro; Phil England returns to year zero of UK free music with the story of Victor Schonfield and Music Now; Tirhakah Love enjoys an audience with Philadelphia photographer, performer and polymath Mhysa; Noel Meek surfs the latest wave of New Zealand psychedelia with Orchestra Of Spheres"
"On the cover: Over 20 plus years Low have established themselves as unique song stylists. But what drove the trio to bury their songs beneath layers of electronics on their latest album Double Negative?. 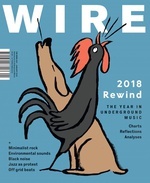 Also in this issue: Music And Mental Health: An innovative new project in South West England aims to help residential patients articulate their ideas of freedom through experimental approaches to sound. Klaus Schulze: As a member of Tangerine Dream, Ash Ra Tempel and Cosmic Jokers, and most crucially as a solo artist, the German synthesist has helped shape the sound of electronic music. 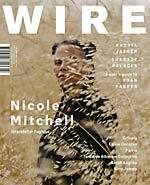 Plus: Sarah Kenchington, Fauxe, Tengger, Makaya McCraven, Global Ear in Northern Egypt, Oliver Coates is tested by the Invisible Jukebox, The Tapeworm's Philip Marshall chooses The Inner Sleeve, an Epiphany by Poulomi Desai, and 37 pages of new music reviews in Soundcheck." 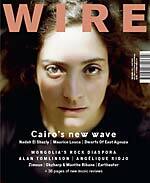 "Cairo's new wave (Nadah El Shazly, Maurice Louca, Dwarfs of East Agouza); Mongolia's Rock Diaspora; Alan Tomlinson (Since the early 1970s the UK trombonist and improviser has balanced unorthodox strategies and playful humour with a serious commitment to his art); Angelique Kidjo; Zimoun; Okzharp & Manthe Ribane; Eartheater. Plus 36 pages of new music reviews. 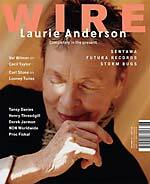 "On the cover: Laurie Anderson (More active now than ever, the multimedia artist and performer discusses a career marked by hybridity, borderless networks and a new interest in virtual reality). 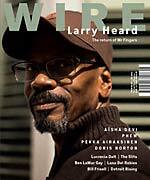 Inside the issue: Cecil Taylor (When the revolutionary pianist died in April, jazz lost one of its most uncompromising individualists. Author, photographer and historian Val Wilmer recalls their encounters); Senyawa (Javanese musicians and instrument makers Rully Shabara and Wukir Suryadi fuse metal with trance to create overwhelming fields of sound); Global Ear: Veracruz; Invisible Jukebox: The Storm Bugs; plus: Tansy Davies, Rodrigo Tavares, Sarah Hennies, Futura Records and more." 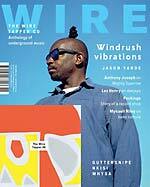 "The Wire Tapper 46 -- attached to the cover of every copy of the April issue will be a CD of the latest in our ongoing series of underground music anthologies, featuring 20 new tracks by Lino Capra Vaccina, Ryan Porter, Saint Abdullah, Capri-batterie & Stewart Lee, and more. 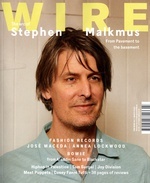 Meanwhile, inside the issue: an Invisible Jukebox interview with the influential writer, photographer and black music historian Val Wilmer... Michaelangelo Matos provides a listener's guide to landmark pirate radio DJ sets from the 1980s to the present day... sought-after designer Robert Beatty on The Beastie Boys and their groundbreaking magazine Grand Royal... Emily Pothast recalls a childhood listening to oldies country music stations... and more." 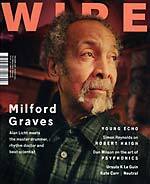 "On the cover: Milford Graves (Alan Licht meets the master drummer, rhythm doctor and beat scientist). Inside the issue: Robert Haigh (from industrial music via drum 'n' bass to minimal piano, the former Omni Trio operative has carved out a unique career thanks to his deeply interrogative approach to rhythm and melody); Psyphonics (the esoteric practice of channeling ideas and informations via sound has an extensive secret history, taking in TC Lethbridge, Daphne Oram, Chris Watson, Led Zeppelin and Aphex Twin); Invisible Jukebox: Young Echo (Will the Bristol collective fall prey to the killing sound of The Wire's mystery record selection? ); Global Ear: Belfast." 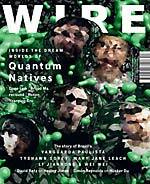 "On the cover: Inside the dream world of Quantum Natives (Scattered across the globe but digitally connected, Brood Ma Yearning Kru, recsund, Rosen and other QN operatives are forging parallel futures for electronic sound and vision). 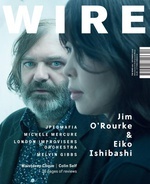 Inside the issue: Hedley Jones (The Jamaican audio engineer died in September having altered the course of 20th century music with his sound system innovations); Li Jianhong & Wei Wei (Blending horror and sci-fi obsessions with DIY experimentation, the musical initiatives of Li Jianhong and Wei Wei have placed them at the cutting edge of the Beijing scene); Once Upon A Time In Sao Paolo (The collision of pop and avant garde music in the late 1970s gave rise to the fiercely independent and still influential vanguarda paulista movement); Invisible Jukebox: Tyshawn Sorey." 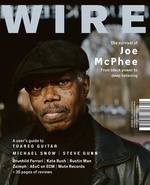 "The Wire Tapper 45: The next volume in our exclusive series of underground music anthologies will be attached to the cover of every copy of the November issue -- 20 new tracks from Nicole Mitchell & Haki Madhubuti, Off World, Geodetic, Ensemble Minisym, Caroline Devine, Matti Bye, and more. 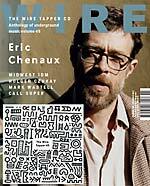 Inside the issue... Dan Spicer talks to Canada's cosmic troubadour Eric Chenaux; Jacob Arnold tells the story of Milwaukee's 90s DIY IDM rave scene; Erik Davis hymns reborn Bay Area synthesist Pauline Anna Strom; Can's biographer Rob Young remembers the late Holger Czukay; Maya Kalev meets du jour DJ/producer Call Super; Dan Barrow listens to the sound design of Twin Peaks. 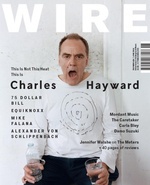 Plus: Invisible Jukebox - Mark Wastell; Epiphanies - Susan Rogers on James Brown; Global Ear - Bogota; Inner Sleeve; Unofficial Channels ; Bites - Ahmed, Mike Dunn, Lea Bertucci, Amanda Kramer's Paris Window, Dead Rider." 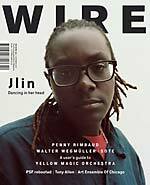 "Jlin, Frances Morgan profiles the Chicago footwork outlier. Meanwhile, inside the issue... Tomokazu Hayashi essays a user's guide to the pioneering electronica of Yellow Magic Orchestra, Ryuichi Sakamoto and Haruomi Hosono. Geeta Dayal meets veteran Swiss visual artist and kosmische music producer Walter Wegmüller. Invisible Jukebox: Penny Rimbaud; Epiphanies: Noel Meek; Inner Sleeve: Paul Steinbeck; Global Ear: Portland; Unofficial Channels: Pop Not Slop. And in the Bites section, we feature: Hanba!, PSF reissues on Black Editions, Marianna Simnett and Dominique Lawarlee." 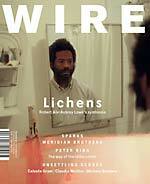 "Lichens, 21st century polymath Robert Aubrey Lowe talks patching up modular synths, vocalising doom metal, and acting the part. Meanwhile, inside the issue... Peter King, New Zealand lathe cutter to the likes of The Dead C, Lee Ranaldo, Acid Mothers Temple, and No-Neck Blues Band. 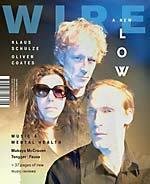 A report on composers who require musicians to throw their bodies as well as their souls into their performances, including Michael Baldwin, Celeste Oram, Louis d'Heudieres, Alwynne Pritchard and others. Plus: Invisible Jukebox: Sparks; Epiphanies: Maggi Payne; Inner Sleeve: Ryoko Akama; Global Ear: Algarve; Unofficial Channels: Pop Not Slop." 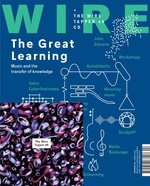 "Stuck to the cover of this month's issue: The Wire Tapper 44 CD, featuring 20 tracks by AGF + Werkstatt, Sarah Angliss, Paul Rooney, Susanna, Hear In Now, Bonaventure, and more. 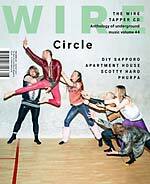 Meanwhile, inside the issue: Finland's postmodern metal masters Circle; New York underground hiphop veteran Scotty Hard; Anton Lukoszevieze, leader of UK chamber music ensemble Apartment House; a report on the electronic explorers and pop-punk mavericks of Sapporo's DIY microscene; and more." 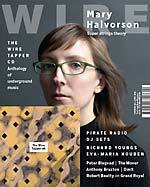 "Afro-futurist composer, improvisor and writer Nicole Mitchell... European electroacoustic cosmopolitan Kassel Jaeger... and in a special saxophone summit, young pretender Seymour Wright essays a user's guide to the recordings of elder statesman Evan Parker... plus all the (un)usual news, views, previews and reviews from the world's greatest music magazine." 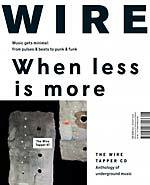 "Stuck to the cover of this month's issue: The Wire Tapper 43 CD, featuring 21 tracks by Electric Sewer Age, Cozmic Corridors, Ulan Bator, Heinali, Ghikas & Walshe, Grails, and more. 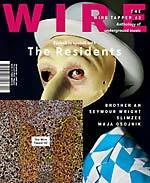 Meanwhile, inside the issue: veteran San Francisco underground pranksters The Residents; world jazz traveller Brother Ah; UK improvisor Seymour Wright; grime guru and Rinse FM founder Slimzee; and more!" 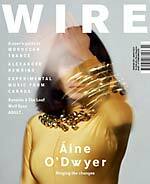 "On the cover: Aine O'Dwyer (Through her sounding of sacred spaces and collaborative projects, the Irish musician moves between the folk traditions and performance art that form her musical heritage). 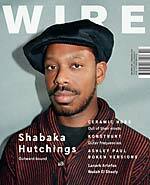 Inside the issue: The Primer: A user's guide to Moroccan trance; Experimental music from Canada; Invisible Jukebox: Alexander Hawkins ; Global Ear: Seoul and Chuncheon; ADULT. (The Detroit electroshock duo bring it all back home); Mary Ocher (The Berlin based artist offers collage without frontiers); Society of Strange and Ancient Instruments (Clare Salaman drags Francis Bacon's utopian music into the present)."